Helicopters are cool. These bubbles of whirring metal that dip and dive at high speed and bank at thrilling angles to swoop us closer to the world, pack a good rush and unbeatable views into one gripping adventure. 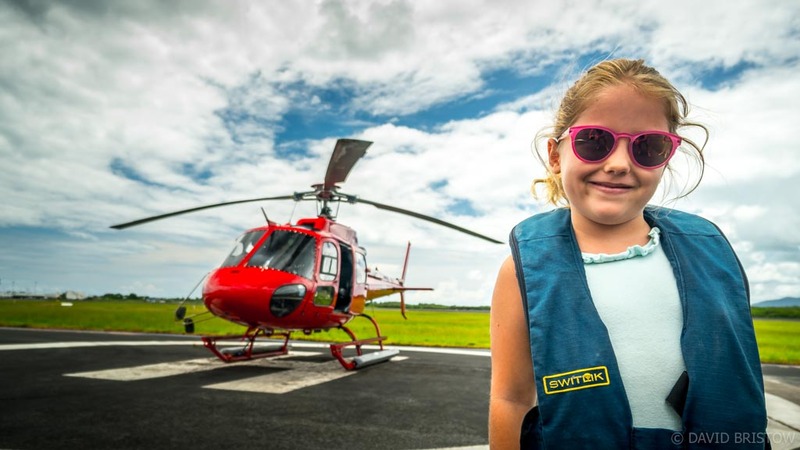 But when my family came to town and the idea was floated that we take a chopper ride out over the Great Barrier Reef, frankly, I wasn’t too fussed. OK, maybe I’m a jaded Cairns local, but because I live aboard a sailboat and am lucky enough to call the GBR my playground, I felt that $399 was a lot of cash to hand over for 30 minutes of flight time. So why then did getting airborne above Arlington Reef give me the best buzz I’ve had in ages? Because the exquisite tapestry of blues and greens that begins a few minutes off the coast of Cairns, is something that you can’t fathom from the sea, and it’s this big picture that makes every minute I spent in the sky well worth the money. Just a quick phone call and I had booked out a 7-seater chopper with Nautilus Aviation for a 30 minute Great Barrier Reef Scenic Flight. The best part of the deal was the huge 30% discount we were offered for being locals, which brought the price down from $399 to $280 a seat. Better still, the discount was extended to the three out-of-towners in our group, meaning that in total, we saved a whopping $714 on our flight. Nice. After a quick safety video we slipped on life jackets and headed for the Nautilus Aviation chopper, two of us in the front and the other four adults wedged into the back. To be honest, it was a bit of a squeeze, but smaller groups might not experience the compression. The pilot put names to what we were looking at, but mostly he just let us enjoy the views. Shooting across Cairns Airport, mere metres above the tarmac as planes took off in front of us, provided the first unexpected buzz of the ride. But once we skimmed the mangrove treetops and headed out over the sea, the unique angle on the ocean was jaw-dropping. The colours of the sea, morphing from murky green to deep shades of cerulean blue as the ocean floor dropped away, suddenly turning turquoise on top of the reef where water lapped over idyllic, coral-fringed sand cays. We flew over sailboats and ferries heading for Green Island, and coasted north over neighbouring Arlington Reef and a solitary speedboat hooked onto the blissful patch of sand at Upolu Cay. Circling in daring manoeuvres meant to thrill, the pilot skimmed across Vlasoff Reef and the tiny, stunning sand cay within, and we honed eagle eyes for mantas and dolphins that might have been cruising far below. Before we knew it 30 minutes was up and we were shooting back towards the coast, beaming. 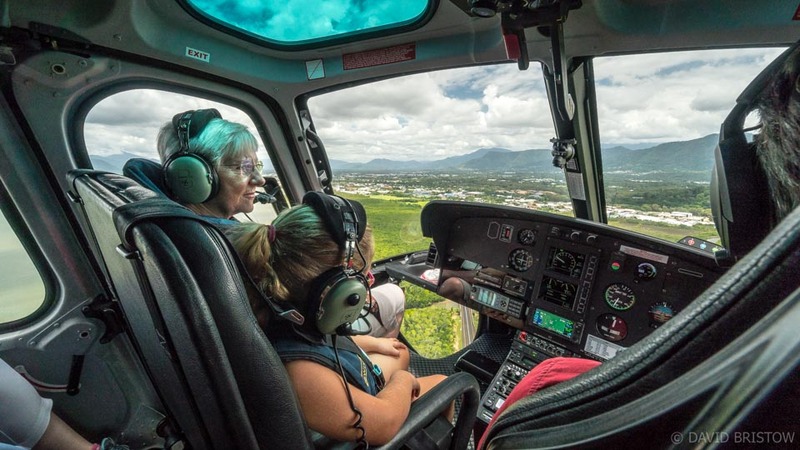 This adventure definitely put our day on a high and although this is the only helicopter operation I’ve travelled with in Cairns, I’d definitely give it the thumbs up. As a Cairns local, the $399 per person price tag was discounted to just $280 – a massive 30% saving. This was especially generous since we were travelling with three out-of-towners who scored the discount too. Children pay the same as adults (phone 07 4034 9000). From 4th April to 18th June, Nautilus Aviation is offering travellers a 20% discount on 30-minute reef flights, to celebrate the Gold Coast’s hosting of the Commonwealth Games. And just so that you know, this is an unpaid post and yes, we forked out every dollar for the experience.